. . . An On-Going Sketch Class . . . Learn to draw the figure by relating disarticulated bones to the living body in Minerva Durham's drawing classes Saturdays and Thursdays at 9:30am and Wednesdays at 1:00 and 6:00. Improve your portrait drawing skills Sundays at 1:30pm in the Portrait Workshop taught by Lyle Gertz. Jerilyn Jurinek teaches Tuesdays at 9:30am, and Chuck Connelly and Kate Norberg teach Nicolaides' "Natural Way to Draw" Wednesdays at 9:30am. Study the long pose with Bob Palevich Friday mornings at 9:30am. 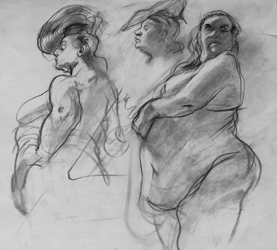 Bring soft vine charcoal, an 18" x 24" newsprint pad and enjoy long and short poses, gestures and croquis in figurative drawing workshops in the company of serious and congenial artists at all levels of skill development. Beginners are welcome. Walk-in, first-come, first served. Spring Studio located at 293 Broome Street is an 'open' drawing studio. We have three 3- hour figure drawing sessions per day (two on Sunday), one in the morning, one in the afternoon and one in the evening. We offer drawing, anatomy, and portrait instruction at no extra fee in 8 classes. Artists who use watercolor, pen and ink, charcoal are accommodated. There are no per-month contracts; if you miss a class you do not pay for it. The art studio is convenient to most subways. • 6:00 pm to 9:00 pm. Minerva's Drawing Studio is located at 293 Broome Street, East of Broadway, between Eldridge and Forsyth Streets. Minerva Durham is quoted in Peter Steinhart's best-selling book on figure drawing: The Undressed Art, Why We Draw,and a drawing by her was included in A Decade of Contemporary American Figure Drawing, curated by Norman Lundin in 2002 for the Frye Art Museum, Seattle. An article in the New York Times, A Beginner's Guide to Walk-In Art Classes, praises her teaching and describes her as, 'an earthy hippie with a gentle manner.' David Sedaris short story “Memento Mori” mentions her and her Skeleton. Born in St. Louis MO, Minerva Durham has lived in NYC three decades. She taught drawing at Parson's School of Design for ten years before opening Spring Studio in SoHo. For twenty-five years she presented figure-drawing sessions there open to the public seven days a week. The studio moved to 293 Broome Street when its lease on Spring Street was not renewed. The studio has exhibited the works of hundreds of artists, both professionals and students, and has presented many events of music, dance and writing, and Body Painting based on the nervous, muscular and circulatory systems. Click on E-Mail for Inquiry - regarding pricing and availability. All artwork is copyright of the respective owner or artist. All other material © Copyright 2018 New York Art World ®. All Rights Reserved.